First of all, get XenCenter 6, the management GUI for XenServer. Use 6.0 to do the upgrade with. 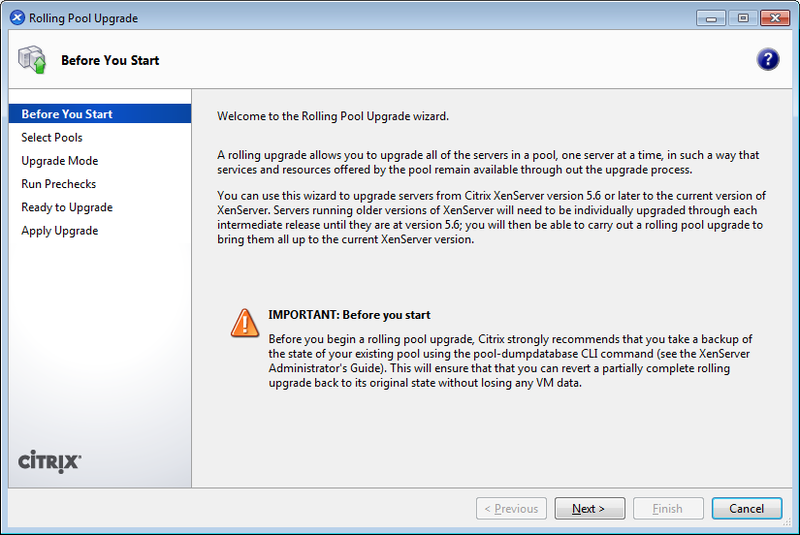 One of the features is “rolling pool upgrade” which manages the upgrade process for you. The basic process from the rolling pool upgrade is to stop the VMs on the master, reboot, upgrade the master, stop the VMs on the next pool member, reboot, upgrade the member, lather, rinse, repeat. If you choose Manual like I did, the it’ll prompt you to insert the CD you burned at the appropriate times. My second pool member is some old AMD based PC I cobbled together from parts on hand. This one is decidedly *NOT* on the HCL, and it showed. As all the “crap” scrolls by, notice that it seems to not be able to use the PS/2 controller it finds (“Failed to obtain physical IRQ 12”, etc. ), which means that it has issues with the mouse and keyboard. It hangs an inordinately long time at the “detecting hardware” line, but does eventually move past it. The symptom I had on this old clunky non-HCL hardware is that I can’t type once the text installer starts. To get past this, I restarted it, and then hit F2 at the first screen. This will show all the options available. Type safe and continue. The installer starts fine, and completes fine. After the installer is complete, and the server reboots the first time the new install hangs forever on a white Citrix Xenserver screen. You never get the usual progress bar at the bottom. It just hangs here, white, forever (I dubbed this the “white screen of hang”.) I guess the actual install pukes on the bad hardware too. After much googling, I found others that had used the kernel option noapic to get past this. You can manually pass this option to XenServer at boot time as follows. XenServer is trying to boot ‘xe’, so (quickly!) arrow down to xe. Hit tab. Now you can add the option ‘noapic’. Arrow back, back, back until you get on the first line, right after …xen.gz and add the word noapic. Yay! the server boot normally! Whatever noapic does, it does the trick. Note! This is a one time trick! Every time you boot the XenServer you have to use noapic. The next time it boots, you’ll get the “white screen of hang” again unless you interrupt the boot again and pass it noapic. This is not fun, especially since XenCenter will now warn you there are 4 updates that need to be applied, and every one of those needs 2 reboots, 8 reboots total. To fix it (hopefully) permanently, edit the /boot/extlinux.conf and add the noapic entry in the same spot, under the xe entry. And add the nopic as so. I then applied the updates XenCenter recommended, and I could reboot at will without typing. It’s possible that future updates will overwrite this, so if your funky XenServer gets the “white screen of hang”, you’ll have to make this change again. On Windows VM’s, after the XenServer upgrade, XenCenter will complain that Tools is out of date. You need to install the latest tools. This isn’t a big deal, but I fiddled around with it for an inordinately long time, since I didn’t bother to read the instructions. First of all, on my Windows 7 and Server 2008 R2 VMs, I didn’t have .Net 4.0. This is required. Get .Net 4.0 and install it. This may require a reboot of the VM. I downloaded the .Net 4.0 installer from Microsoft, right clicked it, and said “Run as administrator”. (Even though I was already administrator, the installer seems happier doing it this way.) After this installs, run Windows update again, get all of the .Net updates, reboot as needed, run Windows update again, lather, rinse, repeat, until your .Net installation is fully patched. Then, from XenCenter, highlight the VM and pick VM from the top bar, Install XenServer tools. All this really does is mount the installer stuff as a CD in the VM. Autorun will probably prompt you to run the installer. Don’t do this. Right click on the CD and select Open. Right click on the installer and pick “Run as administrator” (even if you are one.) This will require a VM reboot again. Good question, I liked the USB option too. and i don’t have the shell prompt. Do you have any idea? I just need a comparison of ESxi Vmware and XenServer? Which one would you recommend and use the most especially for production? I am using ESXI and currently having a problem mounting USB flash or external drives on all VM machies. Next SLO VMware User’s Group Meeting is April 30th!